Today’s post is sponsored by Meijer. All opinions are my own. This year is FLYING by and I cannot believe it’s already November! Thanksgiving is just around the corner and before we know it, it will be Christmas! The holidays are my favorite time of the year; there’s just something about cozying up with the fireplace on, spending time with family and making memories together. It’s gotten super cold super quickly around here and I’ve been slowly adding warmer pieces to my wardrobe. 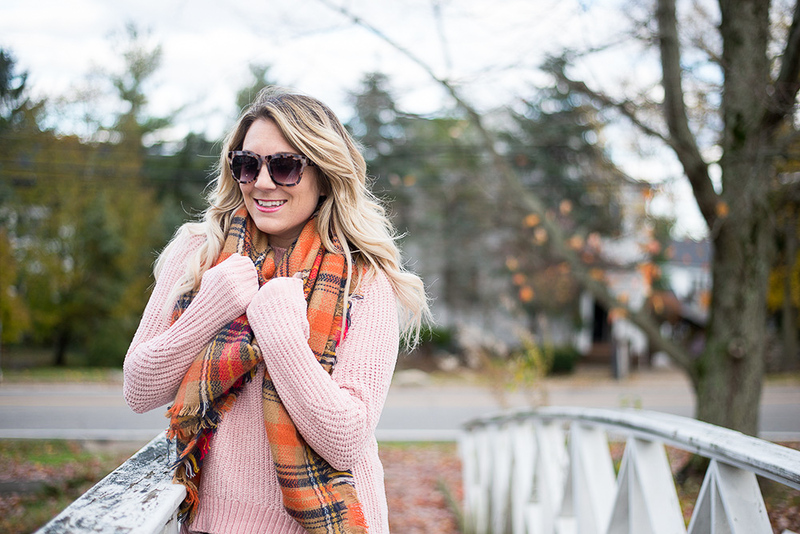 I picked up a few pieces at Meijer on my last trip and wanted to share some winter fashion inspo! 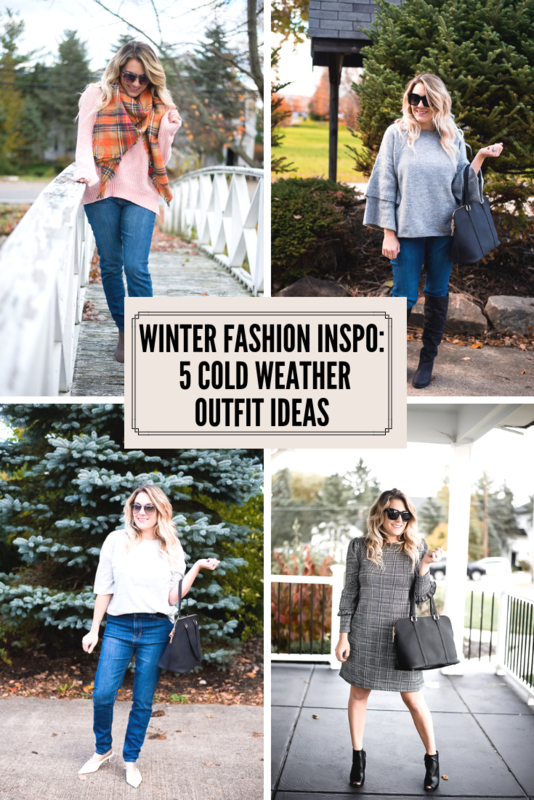 I put together 5 different cold-weather outfit ideas ranging from super casual looks to a few on the dressier side! I also picked up some pieces for my mini me and as you can see, she was quite the fan! I tend to stick with basics and then mix and match or add statement pieces to complete the outfit. There’s also a lot of layering going on in the colder months because it’s freezing outside and then when you get to where you’re going, you’re usually sweating, right?! Like I mentioned, layering is everything right now. I picked up this asymmetrical cardigan with the faux leather stripe and paired it with a tank and jeans. But you could also wear it with a dress, leggings, whatever! 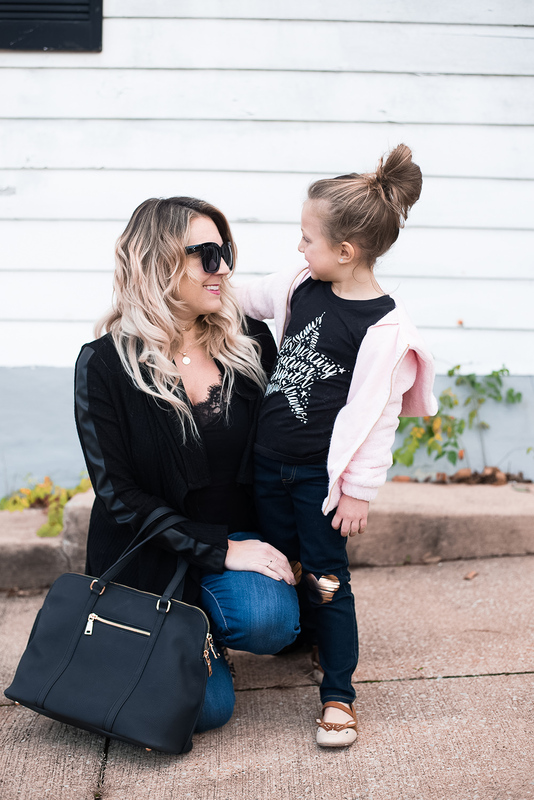 You can never go wrong with a black cardi and I love this faux leather stripe to give it a little more of an edgy vibe. Next I picked up two different gray sweaters because gray is classic and can go with anything. 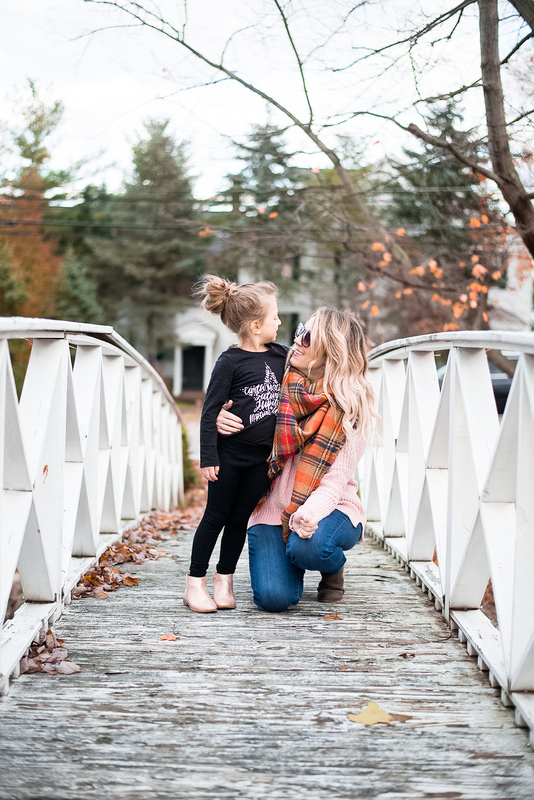 I styled the ruffle sleeve sweater with high boots, perfect for running weekend errands or even for Thanksgiving dinner! 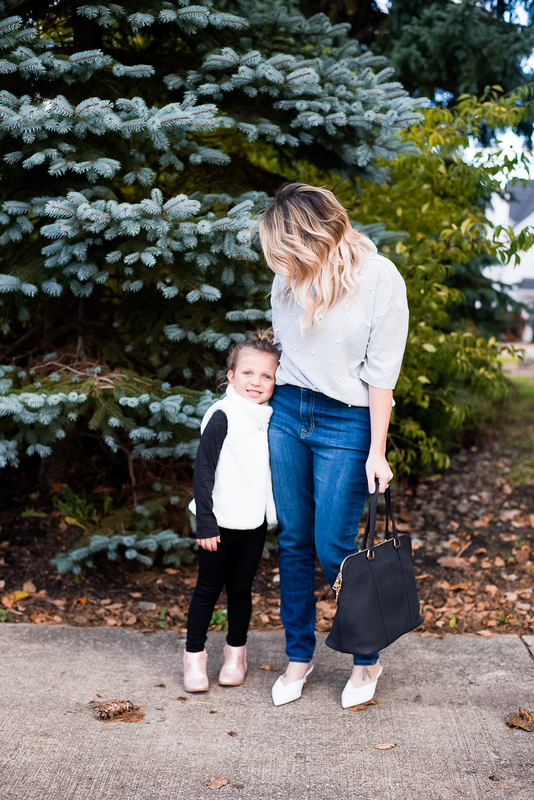 I loved this pearl embellished sweater as well and chose to wear it with these open back kitten heels, but it could also be worn with booties and look just as cute. These jeans are from their Massini brand and have a great stretch to them as well. Perfect for Thanksgiving dinner 🙂 P is wearing a pair of textured leggings and a faux fur vest with the same shirt as earlier. I love buying basics like this that she can either wear to school or dress up for special occasions. Kids grow too fast so when I can get more bang for my buck, I’m all about it. This pink sweater may be my favorite piece from my haul because 1) I love this color for fall and winter and 2) it’s SO soft! It also came in other colors and I’m regretting not getting the other ones! I wore it with a scarf but would look great on it’s own or with a fun statement necklace as well. But I loved the detail on the sleeves (clearly I have a thing for sleeve details) and felt like it was a super flattering fit. I love that Meijer has sizes XS-3X all in the same place and caters to different body types. Always makes a new mama feel good when hitting the racks after baby! Do you tend to keep it casual or dress up for the holidays? What are some of your go-to pieces? This is a sponsored conversation written by me on behalf of Meijer. The opinions and text are all mine. Love, Love all this outfits! 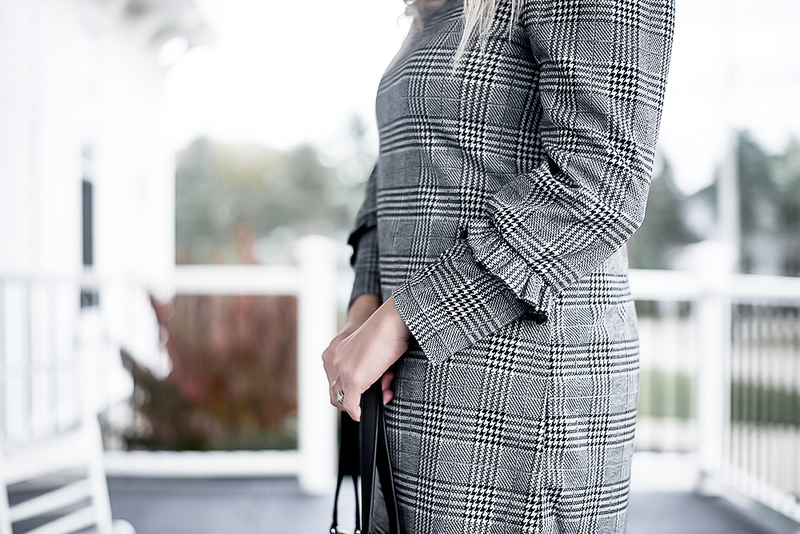 Obsessing over the plaid dress, I can’t wait for it to get cold here in Florida. 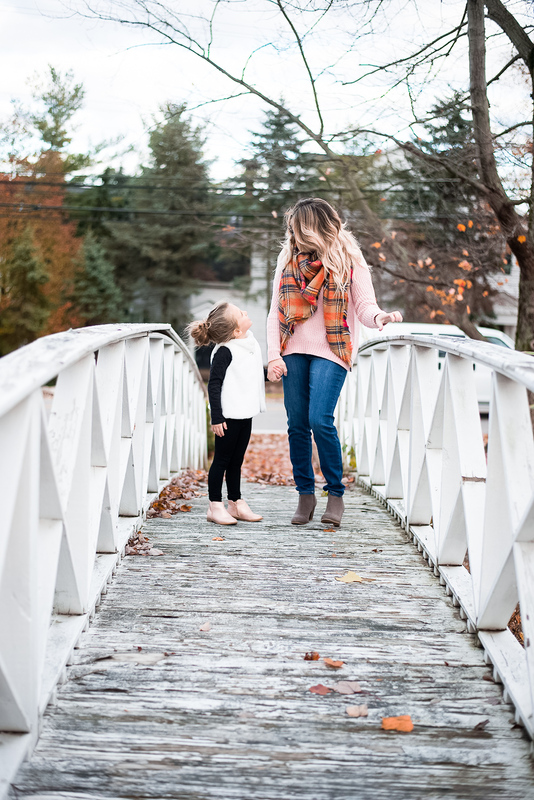 These are super cute winter outfits! So chic! I totally agree that layering is so key! My favorite is the plaid dress and tiered sleeve sweater! 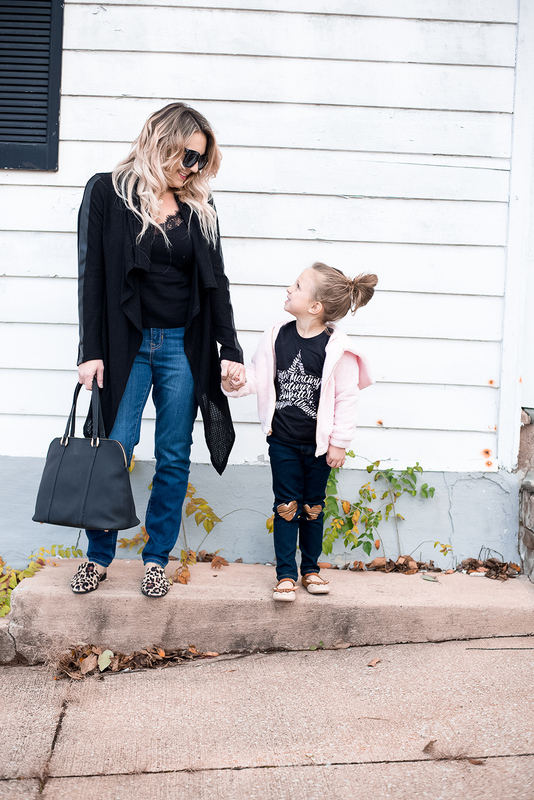 I love the coordinating mommy and me outfits. So cute! Cute outfits! I love your daughters faux fur vest and pink jacket, they are adorable! Fashionista in the making!! I love the statement sweaters!! All of these outfits are so cute! Super cute looks. Layering is everything for winters. Couldn’t survive without it. These are all such cute outfits! I love the sleeves on the first gray sweater! Love the assymetric cardigan and those sleeves on the grey sweater are so pretty! Love all of your outfits girl! I especially love that sweater! I am all about a good blanket scarf. I also just invested in a will ever coat. What is it with me and gray tops? I’m immediately drawn to outfits with gray tops. Love her little brown shoes more than anything! 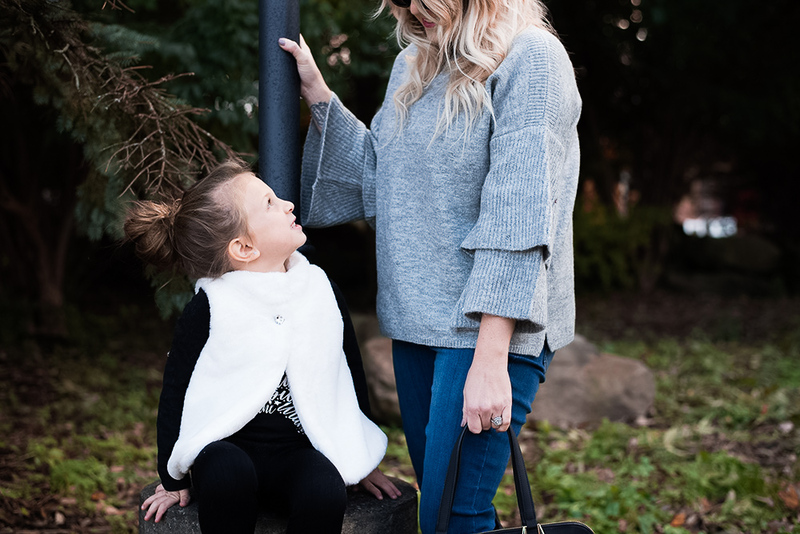 The pearl sweater is another favorite! I love that little miss joined you in these photos! The grey sweater is my favorite! You two are the absolute cutest! I love that bell sleeved sweater! I love the bell sleeve sweater, its really cute! You rocked so many cute cold weather outfit. I gotta agree that layering is everything especially since I live in Alaska. It has been a winter wonderland for a few weeks here already. Love all these looks- you two are adorable! So many cute outfits! Love that little pink sweatshirt your daughter is wearing! love all these looks babe! 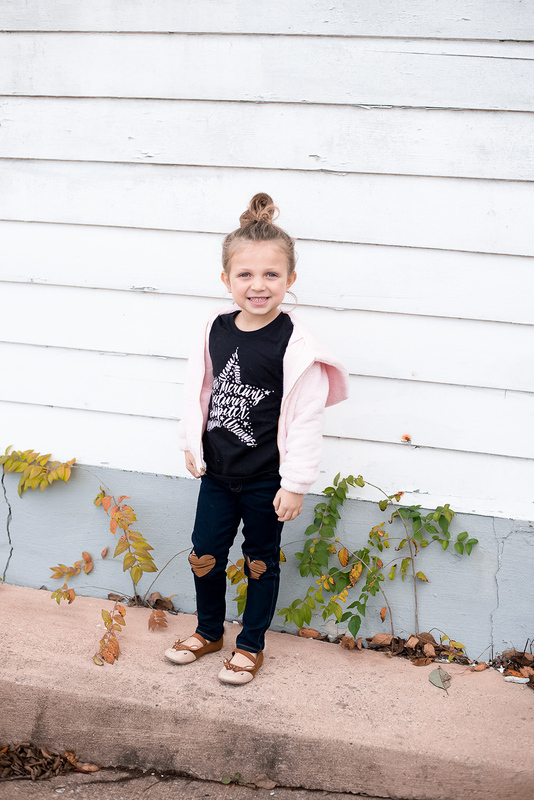 Your little one is too stinking cute! Such cute photos of you two, I love the outfits!